A new £1m steel facility which will create 28 jobs in South Wales is now fully operational. 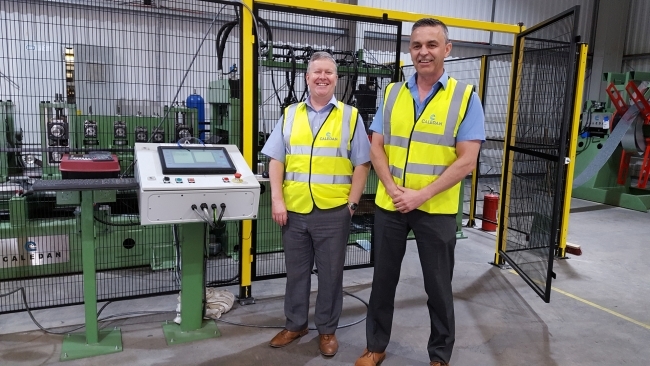 Caledan – a cold steel rolling mill supplying steel frame sections to the construction industry – is backed by £134,000 of Welsh Government funding and has signed major contracts with UK firms to distribute their product, resulting in an immediate recruitment drive. Managing director, Chris Morton said demand was coming from all over the UK and means they are now looking to take on more staff to meet demand. The mill produces two kinds of steel frame sections, Stud and Track and Primaframe. Stud and track is used by the construction industry to provide support within primary structures and the Caledan mill is capable of producing up to 20,000 metres, or 12.5 miles, of stud and track in a single eight-hour shift. At its full capacity, the mill will be able to produce 200 miles per week. 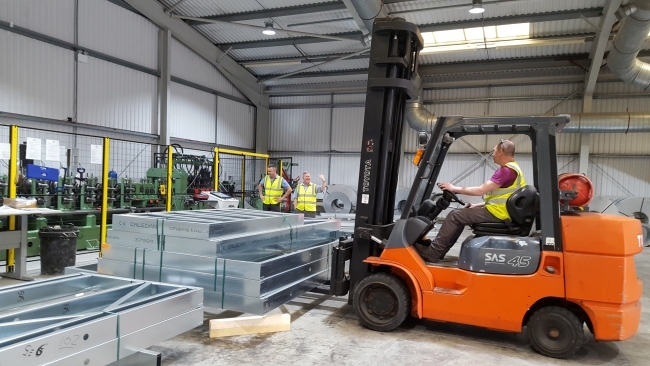 Caledan is also a specialist in the production of Primaframe – complex steel frames which are essentially the load bearing structural frames for a building. While other mills offer the stud and track product, most do not offer the Primaframe variant meaning Caledan is able to provide a more universal service. The advanced machinery and software it has invested in means it is capable of producing 1,000 square metres of frames per day. Caledan, offer CE marked products and are also Steel Construction Institute/ National House Builders Council assessed and accredited for structures up to 11 storeys high. Welcoming the news Economy Secretary Ken Skates said: “The Welsh Government is committed to supporting the steel industry in Wales and I am delighted the mill is now up and running and supplying the local construction industry and creating local jobs. Caledan customer SIG Insulation has also welcomed the announcement. Craig Newman National Sales Director for Insulation and Drylining comments: “SIG began trading 60 years ago from humble beginnings of supplying insulation, and with our suppliers and customers support we are now the leading supplier of specialist construction products in the UK.